As the original California SuperStrat, Schecter’s Contoured Exotic Top is an early classic that helped launched an era of superb music. This six-string, solid body beauty features a flamed maple top draped over alder back, HSS pickup configuration and a Pau Ferro fingerboard. With its quarter-sawn maple neck and its custom C profile, chrome hardware and elegant silver frets, the CET is perfectly balanced and comfortable to play for hours on stage or in the studio. Neatly recessed, the Floyd Rose Pro custom locking tremolo bridge and matching R2 top nut give the CET its iconic vibrato and enable it to survive numerous pullbacks, pitch-mangling wiggles and divebombs. The CET is Schecter at its best. 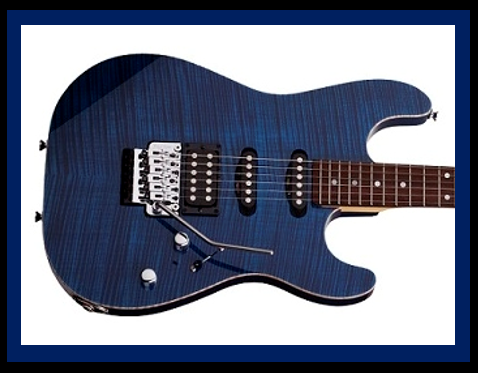 It’s 25.5-inch scales makes the electric guitar ooze with premium tones. As soon as you pick up the CET, it will be love at first strum. The push-pull coil tap in the tone knob makes it simple to switch to a classic single-coil bite and the pickups give you a staggering range of tones—from high-gain shreds to chimey cleans.